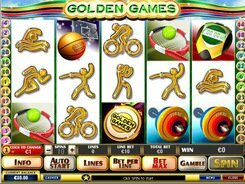 Golden Tour released by Playtech developer is a golf-themed online slot consisting of five reels and five lines. 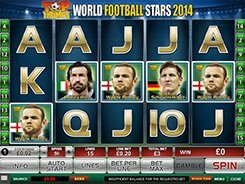 Despite its low-key set-up, the slot keeps up appealing to gamblers across the globe. 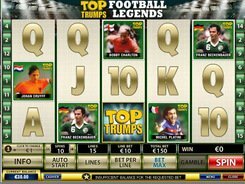 Before pushing the Spin button you need to choose the number of lines to bet on and then make a bet. A coin has a regulated size ranging from $0.01 to $5. The maximal possible bet is $25. The symbols include golf balls, flag markers, golf shoes and other golf-related imagery, including a full beer glass. 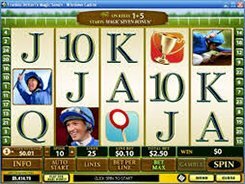 A 2000-coin worth jackpot is awarded for five double golf balls on any active payline, so you can grab as high as $10,000 on a $5 bet. 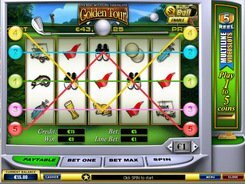 Unlike most video slots, Golden Tour has three scatters: a catfish, a duck and a gopher. Once any of the three scatters hit the reels consecutively, you start the click-me Golfing Bonus feature. Here you should pick a golf club from a total of four and hit a ball into the hole. If you succeed, you get a cash reward. This game comes with the Dollar Ball progressive feature enabling you to hit a fantastic jackpot. Wager $1 and try your luck. Here you get a square divided into 49 blank sections with numbers hidden underneath. Open those five. If all the numbers that you have chosen match up, you hit the progressive jackpot. Four numbers guessed correctly pay out 1 percent of the prize pool. PLAY FOR REAL MONEY!